Russian Food | Love at First Taste! Find Out What RUSSIAN PEOPLE EAT! Russian food is a combination of fish, chicken, cheese, mushrooms, berries, vegetables, fruits, honey and even kasha. In addition to that, you will find crops of rye, wheat, barley, and cereal grain which are a mix of ingredients for a delicious plethora of breads, pancakes, cereals, beer, and vodka. From the left my favorite dish Beef Stroganoff; to follow the popular Borshch, and a glass of Mors. From inexpensive bistros and cafes to top class Russian restaurants, today Russia offer a wide range of delicious Russian dishes for you to taste, especially if you're in the city of St Petersburg or Moscow, the two biggest Russian cities. A traditional meal in Russia is normally composed of three dishes, which are still available on all Russian menus. The starters – Zakuski – might be Russian salad or pancakes with caviar, pickles, homemade sauerkraut, vinegar vegetables and also pies with cabbage, minced meat or potatoes. It is interesting to know that Russian salad is always on the table of Russian people for any bank holiday or celebrations. The first dish - is composed of meat soup with vegetables and grains such as Borsch, Solyanka, Shchi, or a fish soup Ukha or Rassolnik, a soup with pickled cucumbers. You should know that Russians have always attached great importance to soups. Every housewife knows a lot of recipes of soups for all occasions. The second dish - is composed of fish or meat with a side dish prepared and served in one piece. An example is roast from a whole bird, suckling pig or ham. Exception is a jellied minced meat called Holodets. Rice, buckwheat, potatoes, pasta, stewed cabbage are all very popular garnishes. Wondering also what to drink? The most popular Russian alcoholic drinks are wine, Russian beer and, of course, Russian vodka. 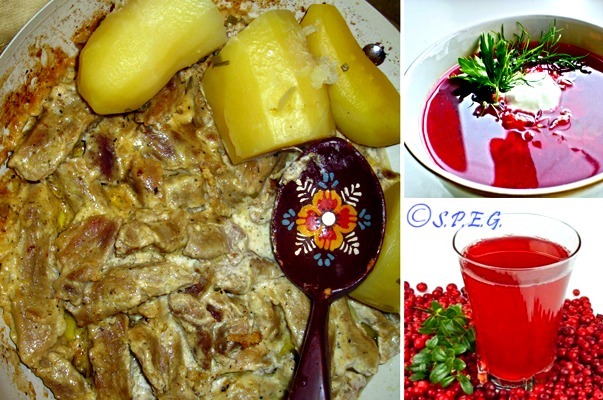 Among non-alcoholic traditional drinks, you will find berry water or so called Mors (my favorite☺), a sort of compote made of stewed fruit and a sweet drink resembling thin jelly known as Kissel. 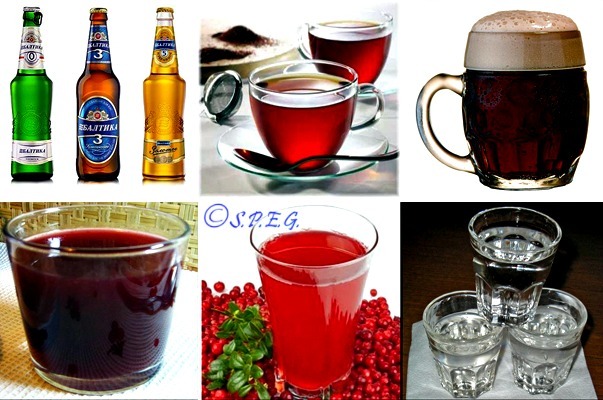 Old drinks such as Sbiten or Kvass are also famous Russian drinks and not found in the traditions of other nations. In addition, I must mention Russian Tea, which has been a very important part of Russian culture for generations. Together with pastries it completes the Russian meal. Do you want to know more about Russian food? If so, see below our list of most popular Russian dishes and drinks, and get acquainted with Russian food. To get started, just click on one of the topic below to fast track to that section. "Russian food is about salt, mustard, horseradish, onion, garlic and black pepper. They are the traditional set of seasonings that it is difficult to do without in a Russian kitchen. In Spring and Summer they are supplemented by dill, celery and parsley - traditionally the country's favourite herbs". A typical Russian meal starts with appetizers (zakuski), moves on to a hearty bowl of soup, followed by an equally hearty main course. Then it ends with a dessert. Ikra is famous Russian black caviar (the roe of members of the sturgeon family), which has long been celebrated as a tasty and nutritious fish product - although in old Russia it was never considered a delicacy. Today, it is a very expensive Russian food and not really popular among ordinary Russians who prefer eating inexpensive red caviar on holidays, which is also more tasty. 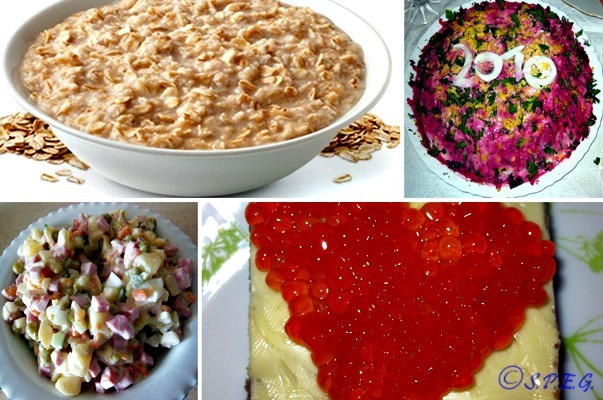 Photos of several Russian food: Kasha, Olivier Salad, Selyodka Salad, and Red Caviar. Olivier is a traditional salad dish from Russia, which is also popular all over the world. It is made with diced potatoes, carrots, onions, pickled cucumbers, eggs, and beef (chicken, boiled sausage, ham). It is dressed with mayonnaise and usually sprinkled with parsley and dill. A cheaper variation called Stolichny salad (Capital Salad) exists, but is less popular in our culture. Olivier is a very popular Russian food that has become one of the main courses served during New Year celebrations and many other holidays. Selyodka pod shuboy can be translated as Herring under a fur coat (shuba). It is a layered salad composed of diced salted herring covered with layers of grated boiled vegetables (potatoes, carrots, beetroot, onions). Like most Russian salads it is dressed with mayonnaise. Some variations of this dish include a layer of freshly grated apple. Grated boiled beetroot as a final layer gives the salad a rich purple color. Dressed herring salad is often decorated with grated boiled eggs. Holodets is jellied minced meat. The texture of it is like small pieces of meat in a cold jelly. There are also vegetable cuts, spices and sometimes eggs inside the jelly. Classical Holodets is made by cooking pork parts that contain a lot of bone, skin and cartilage (such as legs, ears, and even hooves) or just beef. Holodets is the best meat appetizer with vodka and is a traditional dish for many Russian celebrations. At least a thousand years old, Kasha is one of the oldest known dishes in Eastern European Slavic cuisine. Kasha is a cereal commonly eaten in Russia. It can be made from any cereal, especially oats, buckwheat, wheat, barley, millet and rye. There is a Russian proverb “Щи да каша – пища наша” (Shchi and kasha are our food), meaning that these two Russian dishes are all we need to live on. This only explains why it is a popular Russian food, very easy to find in any supermarket. Soups have always been important in Russian food because their roots belong to the past. Borshch or Borscht is one of the most popular everyday Russian dishes. It has a Slavic origin and can be found in Poland, the Ukraine and Russia. Borshch is cabbage soup with a fatty meat-stock base and added beetroot, which gives it its characteristic dark red colour. 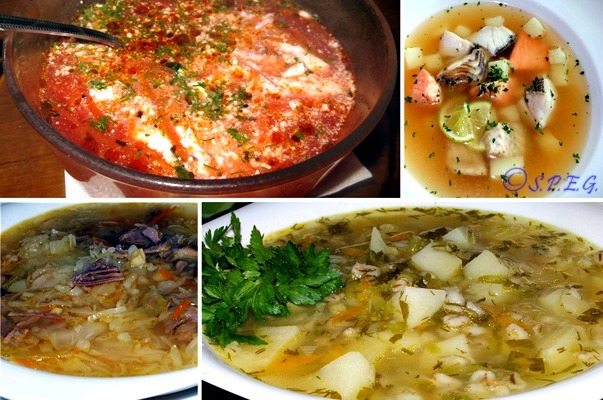 Photos of several Russian Soups: Borshch, Ukha, Shchi, and Solyanka. Shchi is a traditional soup of Russia where it has been known as far back as the 9th century, soon after cabbage was introduced from Byzantium. Сabbage is the primary ingredient in this soup. Shchi is relatively easy to prepare with or without various types of meat (beef, pork, lamb, or poultry). It was noticed that most Russian people do not get sick of shchi and can eat it daily! In fact, in almost every fridge in Russia, you can find a big pot of shchi cooked for several days. Solyanka is a thick, spicy and sour soup in Russian and Ukrainian cuisine. There are three basic types of Solyanka, with the main ingredient being either meat, fish, or mushrooms. All of them contain pickled cucumbers with brine, and often cabbage, salted mushrooms, smetana (sour cream), and dill. Ukha is a clear soup, made from various types of fish such as sturgeon, salmon, or cod. It usually contains root vegetables, parsley root, leek, potato, bay leaf, dill, tarragon, and green parsley. Ukha is spiced with black pepper, saffron, nutmeg, and fennel seed. Many travellers visiting Russia claimed that Ukha is one of the best Russian soup dishes. Rassolnik is known to have existed as far back as the 15th century. It is a traditional Russian soup made from pickled cucumbers, pearl barley, and pork or beef kidneys. A vegetarian variant of Rassolnik also exists. Name of the soup comes from “Rassol”, a liquid based on the juice of pickled cucumbers with some other additions. Rassol is also famous as a hangover treatment. Main courses in Russia are made of different types of Russian food. Surely you'll find something that you like. The Slavs acquired the technique of making Pelmeni from the peoples of the Eurasian steppes where there are dozens of different variations on the idea. Today they are one of the most popular dishes in Russian cuisine. Pelmeni are dumplings consisting of a filling wrapped in thin, unleavened dough. The filling can be minced meat (pork, lamb, beef, or any other kind of meat), fish, or mushrooms. Pelmeni can be kept frozen for long periods of time with little loss of quality or flavor. So you can find them in every freezer in Russia. 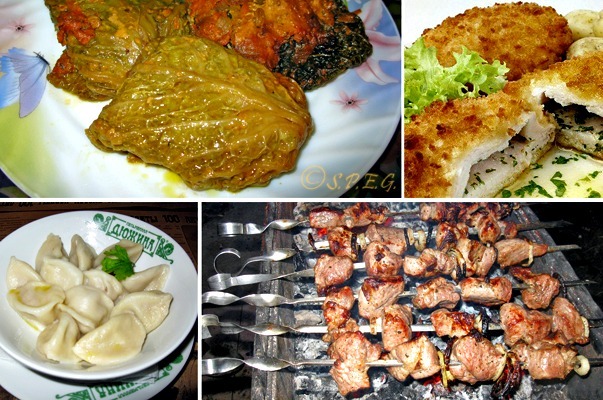 Top Russian food: Golubtsy, Chicken Kiev, Pelmeni, and Shashlik. The name Varenik means "boiled thing", from the adjective Varenyy. Vareniki are kind of stuffed dumplings associated with Ukrainian cuisine. But they are believed to originate from Siberian influences and are really popular in Russia too. Vareniki are stuffed with cheese, mashed potato, cabbage, sauerkraut, hard-boiled egg or with a fruit filling. The Shashlik is the most popular Russian food in Russia. It is hard to say when it appeared in the Caucasus, but it would appear to have been brought by nomads (Maybe Scythians? Arians? We do not know! ): it is at their campsites that archaeologists find ancient braziers on legs, similar to those of today. Meat for Shashlik (as opposed to other forms of Shish-Kebab) is usually marinated overnight in a high-acidity marinade like vinegar, dry wine or sour fruit/vegetable juice with the addition of herbs and spices. Meat can be lamb, pork, beef or chicken. From its origins in 19th-century Russia, Beef Stroganoff (or Beef Stroganov) this type of Russian food has become popular around the world. The name presumably derived from some member of the large and important Stroganov family or a diplomat, Count Pavel Stroganov. Beef Stroganoff is basically tender strips of beef and mushrooms cooked in a sauce with Smetana (sour cream) and served over noodles, rice, or even French fries. Chicken Kiev has traditionally been considered Ukrainian in origin. But the Russian food historian William Pokhlebkin claimed that Chicken Kiev was invented in the Moscow Merchants' Club in the early 20th century. Then it was subsequently renamed Chicken Kiev by a Soviet restaurant. Chicken Kiev is a classic main dish of boneless chicken rolls stuffed with butter and a green onion mixture, then breaded, fried, and baked to a golden brown. This fairly small fish (smelt) has become a sort of “culinary symbol” of St Petersburg, inseparably associated with the arrival of the White Nights. Koriushka enter the River Neva to breed in May. The appearance of this fish at the market and in restaurants and cafes is associated with the start of summer. This seasonal delicacy is usually grilled or cooked in a frying pan in hot vegetable oil. Tasty Koriusaka gives off a slight aroma of fresh cucumbers. Golubtsy appeared in Russia in the 18th century, when French cooking became popular in St Petersburg. The dish got its name from the French practice of cooking pigeons wrapped in cabbage leaves – the Russian word for pigeon is “Golub”. Golubtsy is cabbage traditionally stuffed with meat (beef, lamb, pork). Rice is commonly added to the filling and seasoned with garlic, onion, and spices. It is usually served with smetana (sour cream). Golubtsy is perhaps the most homely of Russian dishes. Among Russian food I must also mention Russian desserts, which a long time ago were called "zaedkami", that means "after-eaters". They were, and still are, served after the first meal, and honestly speaking are very tasty. Bliny, pancakes, one of the oldest ritual dishes of the Indo-European kitchen that was made to celebrate the end of Russian Winter (compare the Celtic dialect words blyni and blyn meaning “end” and the related Indo-European glina meaning something soft). The pancake itself symbolized the sun. In the Russian national cuisine bliny are still today the chief attribute of the popular Maslenitsa celebrations (“Pancake week”/Shrovetide). Bliny may be covered with butter, smetana (sour cream) jam, honey, or caviar. Fillings such as jam, fruit, potato, cottage cheese, cooked ground meat or chicken, chopped mushrooms, cabbage, and many others are rolled or enveloped into a pre-fried bliny and then the bliny are lightly re-fried. 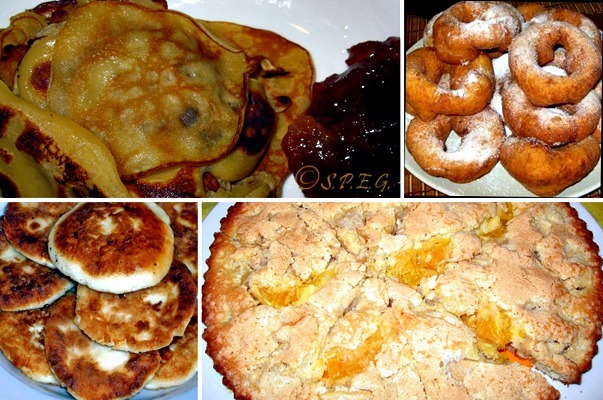 Typical Russian desserts: Bliny, Pishki, Syrniki, and Russian Apple Charlotte. Pirog is a Russian pie that can have either a sweet or savoury filling. The name of pirogi (plural of pirog) is derived from the ancient Proto-Slavic word “pir”, meaning “banquet” or “festivity”. Pirogi are usually made from yeast-raised dough and stuffed with meat, cabbage, mushrooms, potato, fruit jams and many other fillings. The standard shape for pirogi is oblong with tapering ends, but rectangular or circular pirogi are also common. They can be closed or open-faced. Usually, pirogi with a savoury filling are traditionally served (like pirozhki) as an accompaniment with soups or as zakuski. Pirogi with sweet fillings go perfectly for dessert with tea. Pirozhki means a little pirogi, Pirozhki are individual-sized baked or fried buns stuffed with a variety of fillings. They are baked from yeast dough and often glazed with egg to produce the common golden colour. Pirozhki commonly contain beef, fish or a vegetable filling (mashed potatoes, mushrooms, onions and egg, or cabbage). Sweet-based fillings could include stewed or fresh fruit, jam, or cottage cheese. Pishki, (one of my favorite) is a popular Russian dessert which reminds one of doughnuts (puffs, buns). Pishki are round with a hole inside sprinkled with powdered sugar. They are puffy, soft, moist and tender. If you want to try how tasty they are, go to the oldest cafeteria in St Petersburg, Pyshechnaya. Syrniki are cottage cheese fritters garnished with smetana (sour cream), jam or honey. In fact, the name syrniki is derived from the word syr (сыр), meaning “cheese”. Syrniki are made from creamy cottage cheese which may contain raisins for extra flavor, mixed with flour, eggs, and sugar. The soft mixture is shaped into cakes, which are fried in vegetable oil. The outside becomes crisp, and the center is warm and creamy. Sweet syrniki is a favorite Russian dish for breakfast or as a dessert. This dish was invented in London in the early XIX century by a French chef in the service of Alexander I. Originally a dish called Charlotte à la Parisienne (Parisian Charlotte), later became a famous dessert around the world under the name Charlotte Russe (Russian Charlotte). For the cooking of Russian Charlotte the form was spread with Savoyardy cookies or biscuits and then filled with Bavarian cream and whipped cream. The dessert should be cooled to harden. During the reign of Stalin and the fight against “kowtowing to the West” the name was changed to Apple granny. At present Apple Charlotte is a sponge Pirog filled with sliced apples which is very easy to cook. Very tasty!!! Pryaniki are honey cakes, a sort of gingerbread. The name of pryaniki is derived from the adjective “Pryaniy” – spicy. The shape of a Pryaniki is usually rectangular, round or oval with a layer of icing sugar confectionery and a simple design on top. Historically, Pryaniki is a symbol of the holiday, as the ingredients were not cheap. Nowadays, Pryaniki are cheap sweets loved by Russian Babushkas (Grandmothers) and children. Apart from tasty Russian food, there are also several Russian drinks on the Russian menu you should try out. Strangely enough, vodka did not originate in Russia. The story goes that its prototype – aqua vitae (“the water of life”) – was brought to Moscow by Genovese merchants in the 14th century. Granted an audience to Dmitry Donskoy and flattered by his hospitality, they presented him with a vessel of a grape-based spirit. Since then it became gradually popular, firstly across Russia, and later around the world. If you want to combine Russian food with Russian vodka, then you should go to the Russian Vodka Room N.1, the best Russian restaurant in St Petersburg, Russia. Several Russian Drinks: Beer, Tea, Kvass, Kissel, Mors, and Vodka. After vodka, Russian beer with its bitter taste of aroma of hops, is the second most popular alcoholic drink in Russia. The local beer is classified by color rather than fermentation process: Light, Red or Semi-Dark and Dark. There are also strong beers (6-10% alcohol). There were 561 beer producers operating in Russia in 2011. St Petersburg “Baltika” is among the largest beer producers. Some restaurants in St Petersburg have their own breweries. Anyway the beer is good, so give it a try! Mors, (one of my favorite juice drinks) is a refreshing drink made of berries. Though cranberries are the most traditional choice, any berry in season can be used. At present, commercial brands in Russia offer anything from blackcurrant to raspberry. Compote is a traditional Russian drink. Before the XVIII century in Russia a drink from fruits and berries was known as Uzvar (stewed fruit). Uzvar was a festive drink served on Christmas Eve. It was prepared with dried fruits: pears, apples, prunes, plums, raisins. The word “compote” came into the Russian language from French in the XVIII century. Compote is now made of whole, or pieces of fresh or dried fruits cooked in water with sugar and spices. The compote is served either warm or cold. The name “Kissel” is derived from a Slavic word kisly meaning “sour”. The first mention of this fruit liquid dessert in Russia was in 997. Kissel consists of sweetened juice, thickened with arrowroot, cornstarch or potato starch. Russian kissel is made using little starch, so it can be drunk in comparison for example with Finnish kissel. In Russia, the most popular flavours are cranberry, cherry, and red currant. It can be served either hot or cold. The word “Kvass” derived from Old East Slavic kvas meaning “yeast” or “leaven”. The first mention of kvass took place sometime around 1553. Kvass is a fermented beverage made from black or regular rye bread. The alcohol content from fermentation is typically less than 1.2% (0.05% - 1.0%) so in Russia it is classified as a non-alcoholic drink. It is sometimes flavored with fruits or herbs such as strawberries, raisins or mint. Kvass is also used for preparing a cold soup okroshka. Kvass has been recently marketed as a patriotic alternative to cola. The Soviet Champagne dates back to the sparkling wine that Prince Golisym produced on his Crimean estate Novy Svet, which was awarded the Grand Prix at the world exhibition in Paris in 1900. Founded by Anton Frolov Bagreyev, this drink is very popular in clubs, bars and restaurants. Georgian Wines (my favorite) are lively and complex with their specific aroma. Their quality applies especially to the red table wines, among which pride of place goes to the long-established Muzukani (kept in oak casks for at least three years; dark red with a distinctive aroma), Saperavi (the dyer - naturally semi-sweet with a strong distinctive bouquet and harmonious taste), and also to the later Kindzmarauli (with a strong distinctive bouquet aroma and a velvety taste). Everyone has his/her own tastes when it comes to eat or drink. That's fine! But if you plan to visit Russia, you should really try out Russian food, including some of its desserts and drinks. Personally speaking, I believe that experiencing food abroad is a great way to gain an awareness of cultural difference! So see below what Russian food I suggest eat if you'll come. If you love meat you should try the legendary Shashlik, the favorite dish of many Russians, which is available in any sort and everywhere. Shashlik is lamb, pork or beef cooked on a grill, marinated overnight in vinegar, dry wine or sour fruit-vegetable juice with the addition of herbs and spices. Also, you should try Beef Stroganoff or Chicken Kiev, they are both tasty, and both my favorite Russian food. If you're vegetarian, then any type of Russian salad will be fine. Also, you should try both soups, Borshch or Solyanka. In case you miss bread, no worries! Bread in Russia is the most respected food and is associated in Russian culture with hospitality. It is served regularly during the meal and in different ways. For drinks, a Georgian wine fits perfectly with a dish of meat and potatoes, this is something you will hardly find in the West, so don't miss it. Also, any type of Juice Compote like the Mors is a must try. Lastly, if you think to travel to St Petersburg in May, you must surely taste Koriushka, the culinary symbol of Sankt Petersburg. Of course you'll find many other types of Russian food on the menu, but with the dishes recommended here, you should be pretty much satisfied. From Russian Food return to Russian Cuisine or go back to the Home Page.